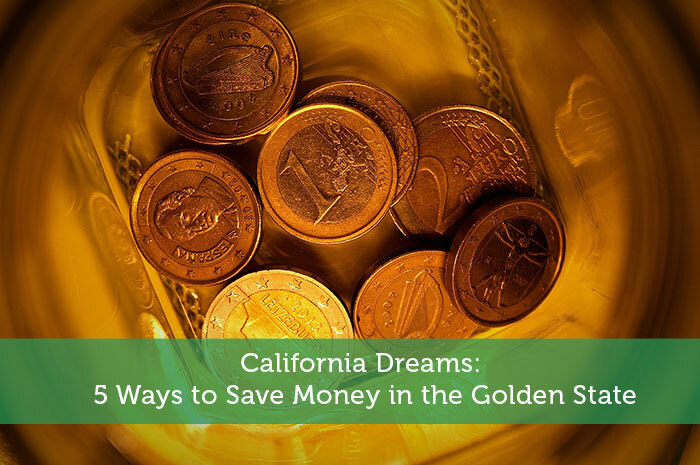 The following is a guest post about 5 ways to save money in the golden state. If interested in submitting a guest post please read my guest post policy and then contact me. Grocery shopping and eating out in California drains money quickly. However, grocery stores present far more opportunities to control spending than restaurants. In fact, with careful planning and coupon clipping, it’s simple to eat well and cut a hefty grocery bill so you won’t soak up the sodium on a stale ramen noodle diet. Remember, you don’t have to clip every coupon; however, if a retail and manufacturer’s coupon becomes available, take advantage. Farmers’ markets are a great way to support the community; however, if you’re residing in Southern California, exorbitant prices for fresh fruit and produce take these venues out of the picture. Instead, look for fresh produce and fruit at smaller chain stores like Henry’s and Sprout’s for weekly discounts. Most chains offer a weekly ad, either mailed, online, or in the store of all the deals. Luckily, quality fresh fruit and vegetables are actually cheaper in most of California than their canned counterparts. For those with enough property, try growing your own vegetables. Make sure to plan weekly meals around the deals in grocery ads. In addition, if you have enough storage room, purchase the maximum amount of a particular item (such as poultry or beef), and freeze it for use in the coming weeks. This way, recipes won’t have you throwing in the towel for frozen meals every night. Besides food, many drugstores offer major weekly discounts on beauty, health, and hygiene products. For even deeper discounts and money-back, drugstores offer reward programs, as well. Walgreen has their Balance rewards system, and CVS offers Extracare savings. There’s no need to totally cut out restaurant trips. Set aside a budget for eating out. Just like groceries and utilities, many restaurants or food spots offer coupons and deals. Consider picking a day or two of the week for meals outside of the home. California represents a hub of fashion. However, for the budget-minded, shopping out of season keeps shoppers in-style and fully closeted. When winter clothing gets discounted to make room for spring and summer outfits, shop the sales and store it for the following year. Never neglect the clearance section. If you have children, go ahead and buy a larger size for highly discounted items; it’s more cost-efficient to stock up with things they’ll grow into eventually. Plus, many department stores often offer sales and holiday specials. Much like the drugstores, having an account with one or two of these stores (Macy’s, Dillard’s, J.C.Penney, etc.) means rewarded savings to pair with sales. Otherwise, stores like Ross, Marshalls, and T.J. Maxx or Old Navy offer discounted, but lasting fashion. As the current economic boom of Silicon Valley highlights a single job market, if you can land a tech-related job and see San Francisco, San José, San Diego, or Oakland as desirable stomping grounds, you’ll surely live comfortably. However, for those outside of the tech world, maintaining payments proves difficult. With housing at the center of much of the economic inequality in California, renting becomes increasingly popular. But with a dwindling middle class, and rent up between 12.3 percent to 4.4 percent in 2013 in these tech-as-king areas, if you’re planning on staying in California for three plus years, buying a house is possibly more sustainable so long as a down-payment is within means. Yet, if you do land a job with Google or Apple, while you’re getting started and saving up, some apartment rentals offer rent-free starter periods as an incentive. In general, if you need to rely on minimum wage in one of these areas, you might want to settle in a more diverse area of California. But if you’re determined, spend every second fixing your résumé and looking for a better, more secure position. Just as many California cities turned to LED street lights as a very controllable means to balancing a troubled budget, new residents similarly receive hundreds in electricity savings by investing in energy-efficient appliances, such as air conditioning systems and washer and dryers. Furthermore, enrolling in load management and off-hour rate programs provide additional yearly savings of up to one hundred dollars. Public transportation works well in San Francisco and smaller knit communities in California. But for the state’s majority, transportation is a high, yet necessary expense. To keep car related fees low, purchase budget-friendly recommended vehicles like a 1993 Toyota Corolla or a 1994 Honda Civic, each costing around three thousand. Keeping slightly older models well-maintained, the hybrid-level fuel economy rates keeps payments under $150 a month. Save your way to a California destination. With these tips, you’ll tackle the Golden State’s high prices with ease. I love the Bay Area, but the cost of housing there is out of control. My sister’s been living in Oakland for a few years, and it seems like everyone’s moving there to escape the outrageous expense of living in San Francisco. Ever since I visited La Jolla this winter, I’ve been fantasizing about living there. That would be a pretty major change from my NYC life. I so much agree with you. My most common way to save money is to shop seasonally. I don’t like to go out so often because when I go to malls, I might be jealous of something especially when it comes to outfits. Before, if I like the outfit I would buy it urgently but now I am starting to save money for my e-fund. We have a 10 year old refrigerator and I’m planning to buy a new one and when I searched for a brand and type of refrigerator, I saw that the Energy Efficient Products really works well. Oh California dreamin’! I’m from the LA area and used to love SF. My feelings have changed as the culture has become more tech infiltrated. California as a whole is a beautiful state with great geography, weather, and diversity. I miss it sometimes! I think if you live in So Cal it’s important to limit your driving and eating out, in order to save money.